The HTC One X10 has leaked a few times before including the hands-on shots as well as the official press render of the device. Today, however, we have got the official poster of the device that hints at the big battery of HTC One X10. It is the successor of last year’s HTC One X9, but leaks have revealed that the processor has been downgraded as compared to X9. As seen in the poster above, the HTC One X10 features almost the same design as offered by Xiaomi’s Redmi Note 4 with that beautiful chrome finish on the Antenna lines. 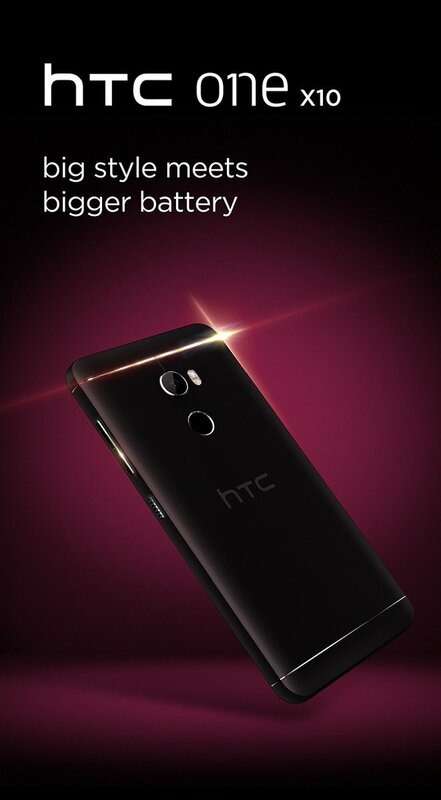 The only difference we can see is the position of LED flash and the HTC logo. The volume rockers and power button are on the right side, and just like many smartphones, the power button has got a textured finish on it. The phone features a rear-facing fingerprint scanner and metal body. Talking about the front, the previous leaks have revealed that the device has a 5.5-inch Full HD display with the capacitive buttons on the front. Other leaked specifications include MediaTek Helio P10 Processor, 3GB RAM, and 32GB internal storage. There is a 16MP rear camera and an 8MP front-facing camera, Since the poster of the device hints at a bigger battery, we hope to see 4,000mAh battery on the phone. As up for now, the design has been confirmed via this new leaked poster, so we hope to see the phone launching in coming days. The expected price is going to be around CNY 2,000 or $290.